We are getting very excited about St. Patrick’s day and mother’s day here in first class. We have made many fantastic art displays with our artistic skills. 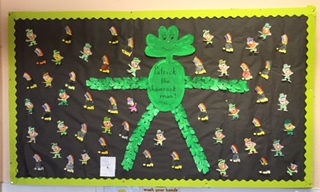 Don’t forget to look up at our class windows to see our leprechaun, rainbow with the pot of gold and shamrocks. Hope you all enjoy the parade! This song can be sung without music – just use the tune of Mary had a little lamb! We love singing it! Here goes…………………..
Do you know where he’s gone? Please tell me where he’s gone!